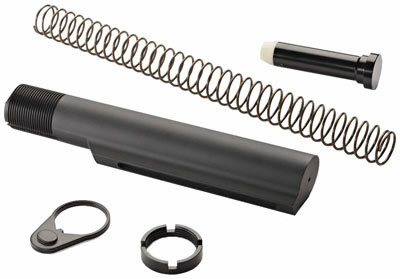 The Advanced Technology AR-15 military buffer tube assembly package fits most AR-15 and AR variants. It features a 6-position, hard-coat anodized 6061-T6 aluminum buffer tube with mil-spec thread diameter of 1.185 in and mil-spec tube diameter of 1.145 in . This assembly also comes with an AR-15 recoil plug, buffer spring, and a steel, military Grade E-coated castle nut and locking ring.